The first night of Austin Fashion Week was a night full of fresh new designer names competing for the fashion bragging rights for one of two coveted awards thanks to BERNINA of America and the Fashion X/Austin Fashion Week. The Warehouse 305 event space was packed with well-wishers to cheer on their favorite designer or family member. The BERNINA Fashion Fund Showcase event marked its fifth-year collaboration with the Fashion X/Austin Fashion Week team headed up by founder Matt Swinney. Each year the mission is to uncover new talent. “We are finding emerging designers in the area and outside the area. The designers have three years or less of experience and we’re creating a platform for them to get exposure for their brand and their designs and for themselves”, said Amy Sherfinski Director of Marketing for BERNINA of America. This year 11 designers sent their five-piece collections down the runway for the celebrity judges panel to see. Designer Ross Bennett, Ross Bennett Collection, Madeline Hollern, Deputy Editor, Austin Monthly, and Lance Avery Morgan, Society Texas, had the difficult task to select the winners. 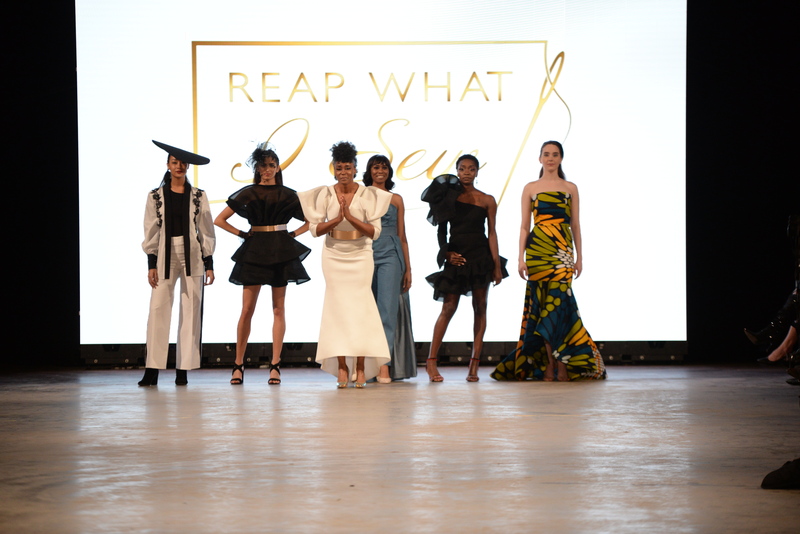 As the collections came down the runway every type of fashion from swimwear and resort wear by Ambria to tailored capes, skirts and uber detailed sleeved blouses from Valerie Garmino. Grunge style, edgy rock ‘n roll looks were shown from the White Teeth Black Lungs label. 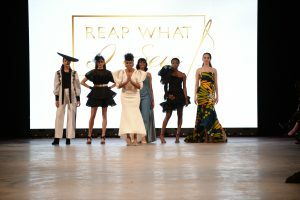 Jennifer Glover-Jenkins, fashion designer and founder of the Austin-based Reap What I Sew label, received the People’s Choice Award. And being named the winner of the category came as quite a shock. “I don’t have a background in fashion at all, I just love fashion! I am a nurse by day,” said Glover-Jenkins. A self-proclaimed “novice”, Jennifer started a few years ago making clothes for just herself. The collection is called Black Butterfly and that is inspired by myself. “I am just this new designer trying to find my way and still evolving,” said Glover-Jenkins. Jennifer was presented with a BERNINA 335 sewing machine, valued at $1,499. The Judges Choice Award was presented to the very marketable collection TP Mini Me – Theresa Pham Designs. “We picked TP Mini-Me because of its scalability. It could go into any type of store”, said Ross Bennett. Theresa’s mommy and daughter collection showed a sense of modern sophistication for mom but yet a fun and dainty matching look for daughters. Theresa’s background stems from a long corporate finance career in the oil and gas business in Houston which she recently left and has jumped into the fashion business without any formal fashion experience. Her recent trip to Europe and Pham’s two young daughters inspired the five-piece collection she presented on the AFW runway. Florals and brights are all reminiscent of her recent travels. “I love the niche I am in. This mother-daughter market and it’s a great way for me to differentiate myself in this world that is so saturated”, said Pham. Future plans for the collection will eventually include Dad! Theresa won the B 480 sewing machine, the top-of-line of the 4 Series from the BERNINA of America line up of products. Congrats to all the participants who entertained the crowd and brought their creativity and spark to the Austin Fashion Week runway. We wish you all much success in your fashion careers. Ambria, BodII BII CorII, Designs. By. LCW, Anmarie Design, Maktub, Rosaluna Designs, White Teeth Black Lungs, Valerie Garmino, Zoe Annette.